The National Transportation Safety Board has released a report of what its investigators heard on El Faro’s voyage data recorder: The captain expressed concern about conflicting weather reports as the container ship approached Hurricane Joaquin’s eye and twice rejected his mates’ advice to alter the ship’s course. NTSB chairman Christopher Hart stressed in a Dec. 13 video­conference that the report — actually five of them, on the ship’s electronics, Hurricane Joaquin’s meteorology, the search for survivors and survival equipment aboard the ship, its engineering systems, and the voyage data recorder — is factual and offers no analysis, conclusions or recommendations. El Faro, a 790-foot roll-on/roll-off container ship, was on a weekly run from Jacksonville, Florida, to Puerto Rico on Oct. 1, 2015, when it sank at 7:40 a.m., 36 nautical miles northeast of Acklins and Crooked islands, Bahamas, with all 33 hands lost. Capt. Mike Davidson had retired for the evening about 8 the night before, the NTSB report states. The voyage data recorder, which captures conversations on the bridge from six microphones, recorded an 11:14 p.m. call from the bridge to the captain’s cabin in which the third mate says that at 4 a.m. El Faro likely will be 22 nautical miles from the hurricane’s center, where the winds are 100 nautical miles per hour. 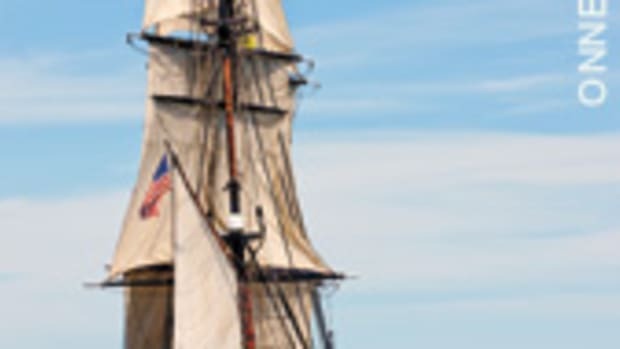 He advises the captain to divert south at 2 a.m. to put more distance between the ship and Joaquin’s center, but in conversation on the bridge with another crewman, the mate says the captain told him to stay the course. The third mate tells the other crewmember that the captain thinks El Faro will be south of the storm at that point and the winds won’t be an issue, the NTSB report states. Then at 1:01 a.m. the second mate, who has taken over the watch on the bridge, calls the captain a second time and makes the same recommendation, but the captain again says to stay the course, according to the NTSB transcripts. The captain returns to the bridge about 4:10 a.m., and 27 minutes later the chief mate gets a call from the chief engineer about the ship’s list to starboard and the effect it is having on engine oil levels. At 5:12 a.m. the alternate chief engineer reports that he has never seen such a sharp list and that engine oil levels are a real problem now. At 5:03 a.m. the captain complains that he is getting conflicting weather reports about the location of the storm’s center. Jim Ritter, the NTSB’s director of research and engineering, says the NTSB is still investigating the reason for this confusion. 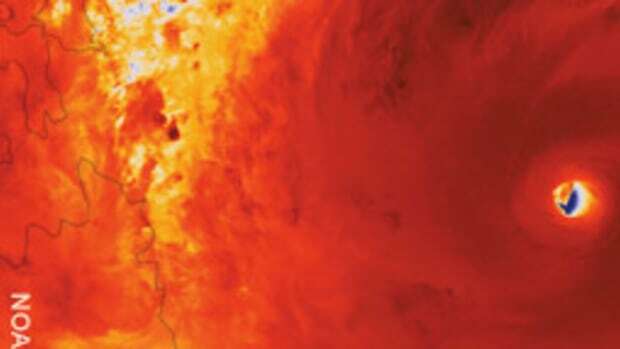 The ship was receiving weather reports from a system called Bon Voyage, which goes directly to the captain’s email. 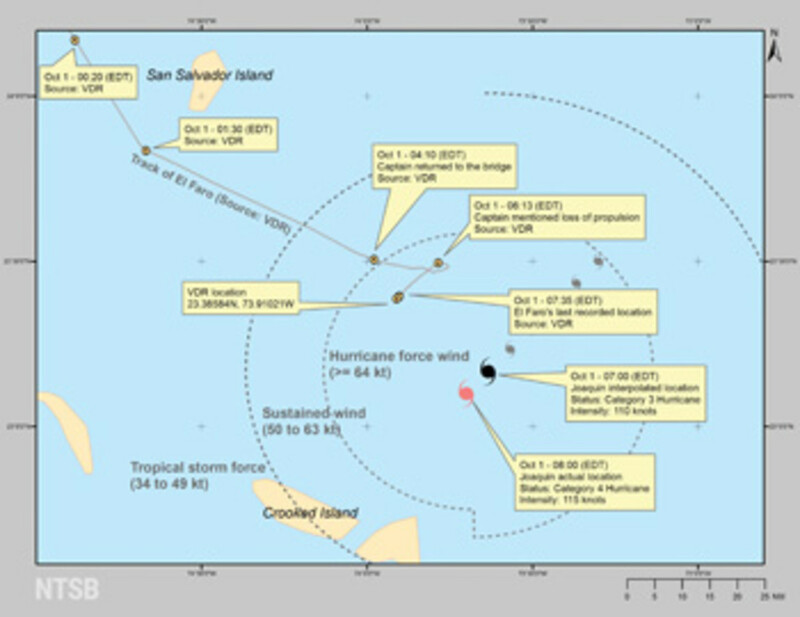 It provides a graphic representation of the weather, but the voyage data recorder shows that the last email from Bon Voyage was not downloaded until 4:45 a.m., 5 hours and 41 minutes after it was available. Meanwhile, Inmarsat-C SafetyNET was delivering forecasts directly to the bridge, but they were not graphic reports and required the watch to transcribe information manually to the ship’s charts, Ritter says. At 5:43 a.m. the captain fields a phone call indicating problems in the ship’s No. 3 hold. He sends the chief mate to investigate, and the chief mate reports back on UHF radio that there’s flooding. Conversations ensue about what to do: pump the water out, or pump it to the other side to counteract the list. The captain turns the ship to port to shift the water in the hold to the port side in an attempt to counteract the list, but at 6:13 a.m. El Faro loses propulsion. 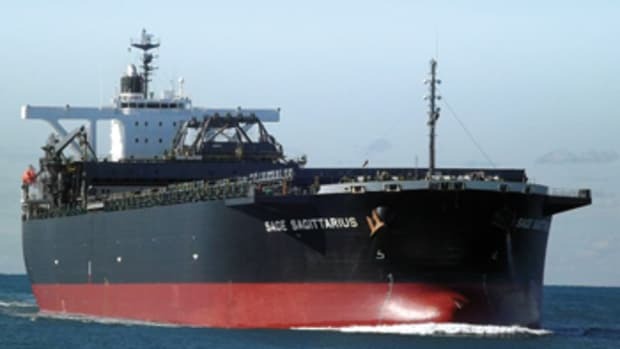 In quick succession the second mate begins formatting a GMDSS distress message, the captain alerts owner Tote Services’ designated shoreside representative about the critical situation and, at 7:13 a.m., the captain orders the second mate to send a distress signal. The ship’s general alarm sounds at 7:27 a.m. Two minutes later, the second mate reports containers in the water, and the captain gives the command to sound the abandon-ship alarm and put the life rafts in the water. The bridge audio recording ends about 7:40 a.m., with the captain and one of the helmsmen still on the bridge. A month after the sinking, a search team aboard the USNS Apache found El Faro at a depth of 15,000 feet near the ship’s last known position. Searchers used side-scanning sonar to find the wreck, which was upright with the stern buried in 30 feet of sediment. The navigation bridge and deck had separated from the ship, along with the voyage data recorder. 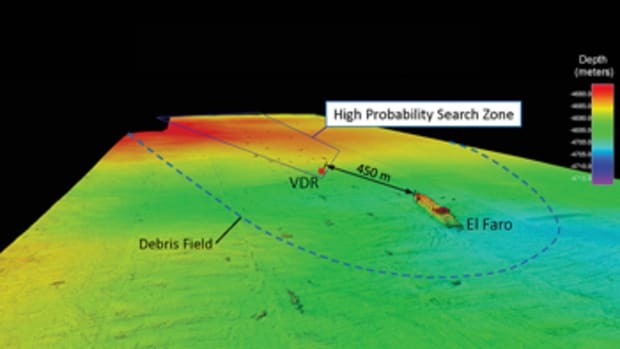 Searchers deployed a deep-ocean remotely operated vehicle to survey and confirm the identity of the wreckage, and two weeks later they located the bridge about a mile from the wreckage, and later the recorder.